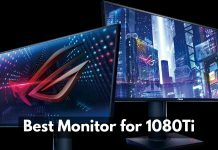 If you prefer a clean, spacious and idealistic desk setup for your dual monitors, then you should check these reviews on the best desks for dual monitors. 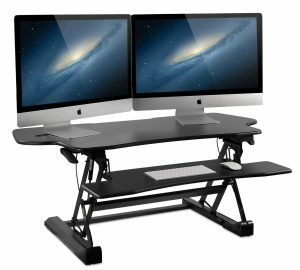 Even though it is the basic setup, the specially designed stand up desk or corner desk can provide enough room not only for dual computer displays but also for setting up the peripherals needed for your productivity or gaming purpose. The Desk-V000B adjustable stand desk from VIVO is a perfect table for the multi-monitor setups. You can easily place this desk on your table to have the comfort of standing or sitting while you work or play. It has a minimum sitting position of 6.5-inch on your desk and a maximum height of 16-inch of the top platform. This desk has a size of 36-inch by 22-inch which offers plenty of room for dual monitors, single laptop, and a monitor plus laptop setups as well as other peripherals like keyboard, mouse, PS4, etc. It has dual tier among which the lower level holds the peripherals and the upper level contains the displays. Easy to assemble standing desk which even a first time user can do easily. It comes with a small storage tray on the upper level to keep your handy stuff like pens, pencils, diaries, cell phones, etc. The cable clip will help you to organize the cords and frame them under the surface of the table. You may know about the health benefits of standing position while you work, especially if you have a full-time job on computers. The standing desk from Rocelco helps you to position the monitors at the perfect height for preventing the possible health issues due to bad posture. The stand is full enough & with 32” length, it can hold two USB powered monitors of 24” each. It comes as ready to use out of the box and so doesn’t need to assemble. This desk is made with the black metal frame to provide durability and stability. It has five different height adjustments which will allow setting it up according to your standing or sitting position. The standing mats will help to reduce strain and to get the comfort level for prolonged standing. 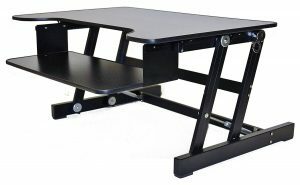 This extra wide standing monitor desk from Mount-It! will accommodate your dual monitor computer setup quite easily. 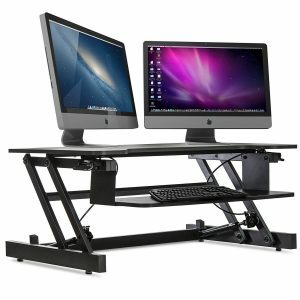 You can quickly move from sitting to standing position with the help of this standing desk converter. The ergonomic design is perfect for the users of any height. This desk has a surface of 48-inch which is enough to support wide-angle displays and other computer peripherals. It comes as pre-assembled, you need to open the box and attach the keyboard tray, that’s it. The design of the keyboard tray maintains the proper height from the monitor to avoid any strain on your neck. However, you can adjust it according to your standing & sitting positions. It comes with a dual gas spring lift mechanism which will help you to change the height of the stand effortlessly. The l-shaped corner desk from Ameriwood Home will provide ample space to keep your widescreen dual USB monitor setup as well as other peripherals like keyboard, mouse, printer, etc. Apart from the wide & long table top surface, it is built with two bookshelves to keep your beloved readings at your hand-reach. It has the holding capacity of 100 lbs. which means you can place your all computing peripherals on it without any worry. The open bookshelves provide enough space to keep your books, binders, and other paper materials. As it has an l-shape built, it fits in the corner perfectly & doesn’t acquire much space in your office or home. This corner desk has 16” height, 16” width, and 8” depth measurement due to which you can easily place it in your office, study room, bedroom, or anywhere in your home. It is available in various colors like Black, Dark Russet Cherry, White, Walnut, and Espresso to let you pick up your favorite color. 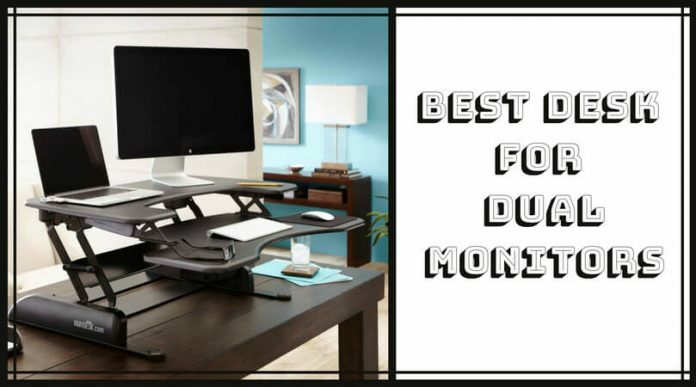 This stand desk riser from CASIII will help you to maintain your health while doing work or play games for a longer time on your dual monitor setup. You can also gift this standing desk to your genius friend for increasing the productivity. It has a size of 32-inch in a two-level desk which is enough for your dual monitor setup. The keyboard tray is placed at a suitable height which you can adjust according to your working position. It comes as pre-assembled, so you need not worry about the assembly. Just take it out of the box and start using it. The two-tier design allows you to place your dual monitors or a computer & laptop at the upper level and other peripherals like keyboard, mouse, etc. at a lower level. This product comes with a unique lifetime ‘performance’ guarantee from the company which allows you to make a hassle-free purchase. 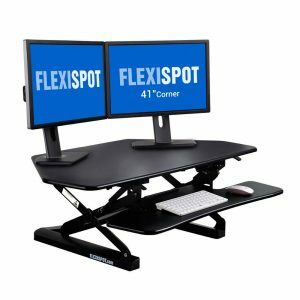 The upgraded 4th generation design of this corner desk from FlexiSpot makes it easy to adjust the stand with a single handle. This standing desk lowers and rises vertically which saves a lot of space on your table. The keyboard tray is deeper which means it will fit your any size keyboard and mouse without making any adjustment. 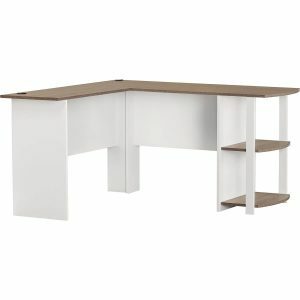 This 41” desk will fit easily in almost all the cubical corners at your home or office. It has an ergonomic design with twelve different height adjustment settings to help you set it according to your standing or sitting position. It supports the weight of the monitors up to 35 lbs. Not only this desk provides comfort to your working or gaming needs, but also it will help to protect the environment thanks to its medium density fiberboard fulfilling the standards of the Air Resource Board of California. 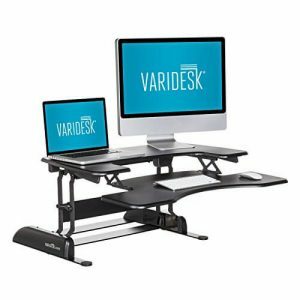 The 36-inch pro plus stand desk from VARIDESK will completely change your way of work or play healthily. You will change your position (standing or sitting) periodically, and according to that, you can adjust the desk height to prevent neck pain. It has a 36-inch surface area which is enough to keep your multiple monitors and laptops. The two-tier design includes the upper level for keeping displays and lower level for keeping your keyboard, mouse, and other peripherals. It has a double handle spring loaded mechanism which will help you to lower or raiser the desk with ease. It comes with eleven different height adjustable settings to make you feel comfortable while standing or sitting. This standing desk is available in four different colors and requires no assembly to use. 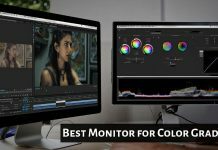 Days are gone now in which you were sitting all day or standing all day due to the inconvenience with the monitor heights, especially with the dual monitor setups. Yes, there are mounting stands available to hold multiple displays, but they also have some limitations. 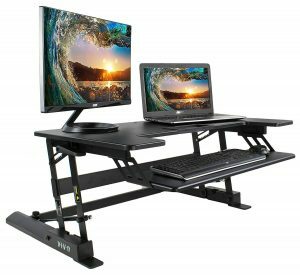 The above mentioned dual monitor computer desks will help you easily & quickly change your standing or sitting positions to prevent some health issues. The market is full of gaming & working desks including wooden desks, L-shaped desks, etc. So, you need to be choosy while buying one and the above list will help you for sure. 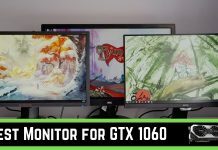 Not only these setups will keep your multiple displays, but also provide ample space for your other computer peripherals.